Big, bold and beautiful, Pritchardia pacifica will surely make an imposing and striking specimen in any garden or landscape. A handsome solitary palm tree that features enormous fronds in almost perfect fan formation in shades of bright green to lime green. 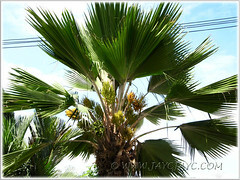 It is well sought after by tropical palm enthusiasts and landscapers for its stunning ornamental beauty. When we first chanced upon this beauty, it was in full bloom and truly caught our attention. A show-off with its chest of treasures, wide-open for all to see and admire! Unlike most tropical palms with long-stalked inflorescences that droop downwards, the Fiji Fan Palm has its gorgeous flower clusters on short stalks that are somewhat upright and prominently displayed among the leafstalks. 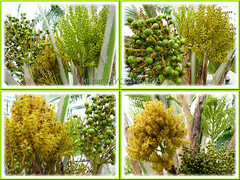 It appears to be a free-flowering palm that blooms profusely in continuous succession, as seen in the images below where all the blooming, fruiting and spent stages are displayed at the same time. Simply lovely, as captivating as its eye-catching fan-shaped fronds! Etymology: The genus name Pritchardia is dedicated to William T. Pritchard, who was a 19th century diplomat in the Fiji Islands, while the species name refers to the area of origin, the Pacific Ocean. Origin: Native to Tonga and Fiji (probably introduced) in southwestern Pacific but naturalized elsewhere in Oceania and widely cultivated. 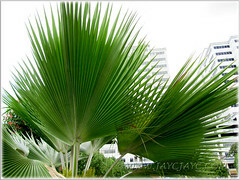 Plant type: A tropical solitary fan palm tree. Features: Pritchardia pacifica is a species of the genus Pritchardia that consists of about 26 species throughout the Pacific, of which 23 of them are endemic to Hawaii. 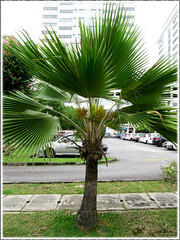 A slow-growing, medium-sized palm tree with an upright solitary trunk that’s up to 30 cm in diameter and slightly broader at the base. It can reach 10 m in height but generally, seen around half that height. 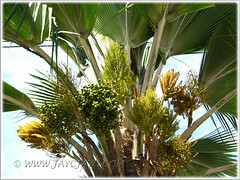 It is topped with a lovely crown of 20-30 large and handsome fronds that are coloured in bright to medium green. 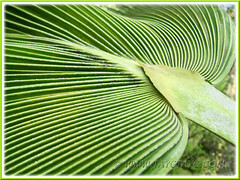 The fan-shaped leaf blade that grows up to 2 m wide is rather rigid, costapalmate and pleated at the base, with about one-third of its length divided into 78-90 distinct segments, presenting a jagged outline. The leaves are held on unarmed leafstalks (petioles), 1 m long and covered with dense grayish-white tomentum. 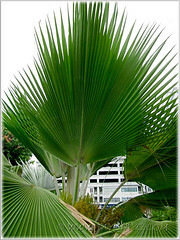 The leaf sheaths are fibrous, fluffy and tawny-coloured, somewhat like that of another tropical palm, Livistona chinensis (Chinese Fan Palm). 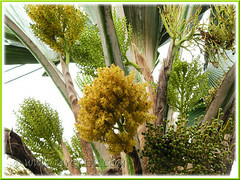 A mature palm tree will bear 1-4 panicled inflorescences in each leaf axil on rather stiff flowering spikes that are shorter than the leaf petioles. Hence, making them beautifully exposed and conspicuous. The bisexual yellow-green flowers will eventually set shiny, berry-like fruits, each measuring 10-12 mm in diameter, changing from green to red and then to reddish-black when ripen, with a single seed within. 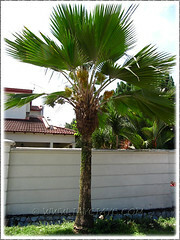 Culture (Care): Like most hardy and robust palm trees of the tropics, Pritchardia pacifica grows easily with minimum care. Light: Grows best in full sun or semi-shade. Soil: Moist and well-drained soil of any type. It is salt tolerant, making it ideal for planting along tropical coasts. Others: It can be fertilized occasionally if you prefer faster growth, otherwise let it grow naturally. Remove withered fronds and spent flower/fruit stalks that are within reach to maintain tidiness. Generally pest and disease free. 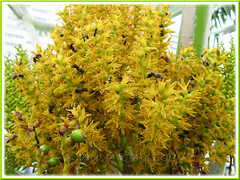 However, it is known to be susceptible to Lethal Yellowing disease in certain regions which will cause fruit drop, flower necrosis, foliage discoloration and death of the apical meristem. So, be on the alert. For subtropical and temperate regions: Hardiness: USDA Zone 10-11. Since it can tolerate cold down to 30°F (-1°C) for a very short period and also sensitive to drying winds, it’s rarely grown in subtropical regions with cold climate. Propagation: Propagate by seeds. Take fresh seeds that germinate well within 30 days in moist and well-drained soil, sited at sunny location. Usage: The strikingly beautiful Pritchardia pacifica is excellent as a garden or landscape ornamental specimen. 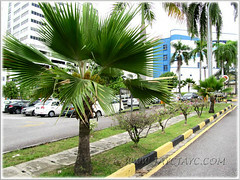 Town and city planners just love planting them along road median, byways and highways, or mass-plant them at roundabouts. A favourite with landscapers that use them to beautify the grounds of commercial properties and public places, such as parks and gardens. Being slow-growing and of medium height, Fiji Fan Palm can be planted in a large container or tub to provide a lovely tropical setting outdoors and indoors. 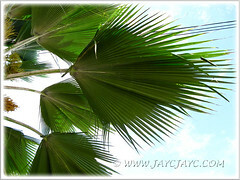 In Fiji, the leaves of Fiji fan palm were traditionally used as fans by the chiefs, as well as for protection from both the sun and the rain, while the trunk is sometimes used for ridge-beams. you are a mine of information – thanks for all the knowledge you share. I love fan palms. 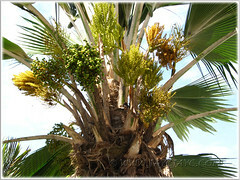 Fan palms are really cool and this particular one with its ever blooming flowers fascinates me so!